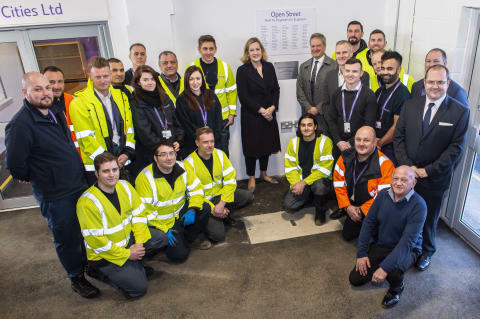 Secretary of State for Work and Pensions, Amber Rudd MP, today welcomed news that Openreach, the UK’s digital network business, will hire 3,000 new trainees – of which around 1,600 are newly created roles - over the next 12 months. The announcement is an extension of Openreach’s largest ever recruitment drive, with 6,500ii apprentice engineers being hired over this year and next to support its ‘full fibre’ broadband build plans. New roles will be located throughout the UK, with trainees joining the country’s largest team of telecoms experts working to expand, upgrade, maintain and install services over Openreach’s national broadband network. Around half of the engineers will be helping to deliver the company’s ‘Fibre First’ programme, which is bringing faster, more reliable and future proof Fibre to the Premises (FTTP) technology to millions of front doors. Alongside the latest recruitment drive, Openreach also announced 11 new locations where it will be building new FTTP networks during 2019iii - including Bury, Barking & Dagenham, Bexley, Croydon, Greater Glasgow region, Harrow, Merton, Redbridge, Richmond upon Thames, Sutton Coldfield, and Salford. This brings the total number of towns, cities and boroughs that Openreach will be building in to 25, with the company on-track to deliver its commitment of reaching three million homes and businesses with ‘full fibre’ broadband by the end of 2020. It wants to upgrade 10 million premises and ultimately the majority of the UK if the right conditions are in place for investment. For the first time, Openreach plans to publish information on its website detailing its build plans for the next 12 months, including the total number of exchange areas to be reached in each location within 24 months. It will also publish details of the specific exchanges where FTTP is currently being built, has already been built, or it intends to start building within the next three months. The company will update this information every three months as part of Openreach’s commitment to supporting the Government’s FTTP ambitions and strategy, as set out in the Future Telecoms Infrastructure Review. Speaking at the official opening of Openreach’s new training school in Peterborough, one of 12 new regional fibre training centres built to support the rollout, Secretary of State for Work and Pensions, Amber Rudd said: “This is a huge expansion in high skilled, well paying, jobs across the UK and yet another demonstration of the jobs success we have seen since 2010. ”Because behind every employment number is a person and family whose self-esteem, mental wellbeing and economic circumstances and life chances are all vastly improved by being in the workplace. “And it is also good news that these are some new training roles, developing the skills of our workforce. “Training and apprenticeships can help create opportunities for women in what are traditionally, male-dominated industries. Welcoming news of the new fibre build locations, Minister for Digital Margot James said: "Openreach's publication of clear plans for where, when and how they will be investing in new fibre networks is an important step. Long term commitments from the industry like this are very important for local communities who need this kind of guarantee on when they will be able to take advantage of the benefits that fibre can bring. "Demand for full fibre broadband is only going to increase, and through our modern Industrial Strategy we've worked hard to create an environment that will encourage commercial investment like this." Clive Selley, Chief Executive of Openreach said: “Openreach is ambitious for the UK and is determined to build full fibre as quickly as possible to ensure the country has a reliable broadband network capable of supporting future data-hungry services and applications essential for boosting productivity and sustaining our position as a leading digital economy. “In the last year, we’ve learnt to build at high quality, and at a competitive cost. This year, we’ll prove that we can build the network on a vast scale and connect customers seamlessly. “We’re making great progress towards reaching our target of upgrading three million homes and businesses to full fibre by the end of 2020 – reaching another 13k premises per week – and these new recruits will play a crucial role in that programme. Openreach is a people business and our new apprentices will enable us to fulfil our commitments, with an ultimate ambition to deliver the best possible connectivity to everyone, everywhere, equally, across the entire country. The new Peterborough training school is one of 12 similar regional centres being built or upgraded across the country and, after Bradford, it’s the second facility to become fully operational under Openreach’s multi-million pound investment plans – with three more due in the next three months. The 100,000 square foot facility includes an ‘Open Street’ – a meticulously designed mock-up of a typical suburban street – which gives new recruits and existing engineers the opportunity to develop and enhance their skills in an authentic, immersive and controlled environment. Around 3,500 engineers will pass through its doors during 2019. Kevin Brady, HR director, Openreach commented: “We want to get on with the job of delivering full fibre broadband to the UK, and that’s why we need to continue growing our team of highly skilled engineers ready to connect homes and businesses across the nation. “We want people from all walks of life to apply for roles at Openreach, to build a diverse workforce that reflects the hugely diverse communities we serve. Last year we successfully recruited more women than ever before – and this year we want to go even further. “Our training schools will help us to meet our new training demands and, in March this year, we’ll have almost doubled the learning days we deliver annually to more than 160,000 – the highest in the history of our business. Enquiries about this story can be made to the Openreach PR team on: 020 7809 7950 or email press@openreach.co.uk. i Fibre to the premises (FTTP) or ‘full fibre’ broadband connections can deliver download speeds of up to 1Gigabit per second (Gps) - enough bandwidth for a family of four to all stream ultra HD or 4k quality movies or TV simultaneously, without interruptions, waiting or buffering. Downloading a typical HD film would take less time than it takes to make a cup of tea. It provides the reliability for everyone to be able to work from home if needed and adds to the flexibility in the workplace. ii Out of the 6,500 total, 3,600 are net hires, having taken account of attrition (e.g. retirement). iii Openreach will build to thousands of homes and businesses in these locations in the first phase, helping to deliver a total of 3m fibre connections across the UK by the end of 2020. The 3,000 roles include (across Openreach’s ten service delivery regions) 226 roles in Scotland; 346 in the North East (inc. Yorkshire and Humber ), 277 in the North West, 280 in North Wales & the North Midlands, 419 in East Anglia, 306 in South Wales & the South Midlands, 334 in the South East, 428 in London, 389 in South Central and 262 in the South West. The business is creating 12 similar regional training centres across the UK in Bradford, Bolton, Crawley, Exeter, Livingston, Newport, Nursling, Peterborough, Romford, Thornaby, Yarnfield and a further centre in Northern Ireland. Ultrafast broadband is defined as speeds in excess of 100 Megabits per second (Mbps). A typical HD Netflix video stream requires around 5 Megabits per second. Successful applicants in England and Wales who complete 12 months at Openreach will receive a BTEC Level 2 Diploma in professional Competence for IT & Telecoms Professionals. Scottish joiners will receive a Diploma for IT and Telecommunications Professionals at SCQF Level. Openreach currently employs 24,282 field engineers and last year hired 3,500 new engineers. Openreach’s UK-wide network is almost 160 million kilometres long – enough to go around the world 4,000 times – serving more than 30 million British homes and businesses and more than 95 per cent of the population. More than 441 trainee engineers will be hired across the South West of England, as part of a huge recruitment drive announced today (Monday 28 January 2019) by Openreach.